Modern slavery is the illegal trade of adults and/or children for the purposes of commercial sexual exploitation, domestic servitude, forced labour, or a modern-day form of slavery, such as cannabis cultivation, street crime, forced begging, benefit fraud, organ harvesting. 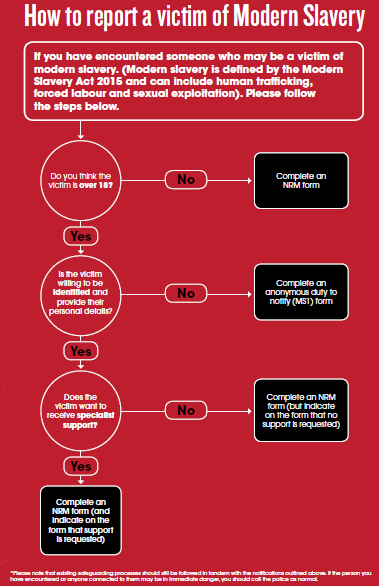 Read the modern slavery factsheet on how to report victims. Read this updated tool on human trafficking from the Department of Health which helps NHS staff identify and care for trafficked people.